Philadelphia Eagles' Head Coach Chip Kelly announced that Michael Vick will be the team's starting quarterback when the season opens September 9th versus the Washington Redskins. This puts an end to the ongoing competition for the position through out training camp and the first half of the preseason. Coach Kelly informed both Vick and Nick Foles this morning of the decision. Both QBs have performed well so far in their appearances, but the coaching staff believes Vick simply was better . They decided to make the decision now rather that wait any longer. Vick has completed 13 of 15 passes for 199 yards while Foles was 11 of 14 for 96 yards. 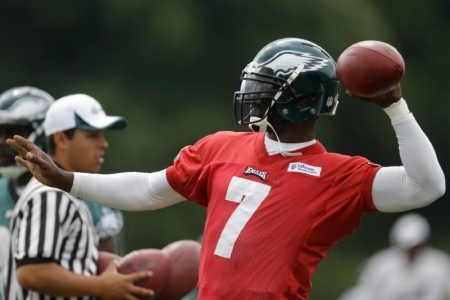 Vick will start Saturday's preseason game against Jacksonville and play the first half. Philadelphia Police are looking for a man who broke into a dentist's office in Pennsport over the weekend. The burglar entered through a side window around 3am at the office on the 1700 block of East Moyamensing Avenue. The entire incident was caught on video as the man spent two hours rifling through drawers and cabinets. He made off with checks, mail, a credit card machine, and computers. He is described as a light-skinned black or Hispanic man between 20 and 30 years old, with a heavy build, goatee, and a tattoo on the back of his neck. An Upper Darby police officer was hospitalized this afternoon after his vehicle was hit by a suspected DUI driver. It happened at 5:00pm at the intersection of State and Miller roads in Upper Darby. The officer was responding to a stolen vehicle call when his patrol car was hit. He was sent to Delaware County Memorial Hospital to be treated for non-life-threatening injuries. The suspect faces pending DUI charges in the accident.